This piece is part of the "Keystone Collection". The sturdy construction and stout features combine a traditional Mission style with an influence of modern design. 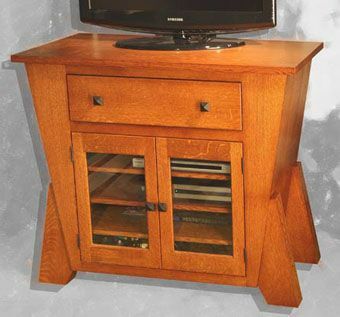 This cabinet is built from quarter-sawn white oak and accented with Mission style hardware. Inside the cabinet is storage for several media components and a dovetailed drawer for convenient storage of DVDs. Also in the "Keystone Collection" is a coffee table and an endtable. This collection can also be constructed from reclaimed timber recycled from barns and other structures. This timber can be finished with a "fuming" process for a unique look. A variety of other woods and finishes are also available.